Envelope Punch Board Gift Box with bloopers! I think that my most neglected piece of kit is my Stampin’ Up! Envelope Punch Board, which is such a shame because it is useful for more than just envelopes. I thought that it needed an airing so I pulled it out, dusted it off, and put it to use making this little gift box. If you want to watch the video, you can do so here. I should warn you there were a couple of senior moments though, and the camera did its autofocus thing again. The finished dimensions are 3″ x 3″ x 2″ and is pretty simple to make. It fastens using a belly band that slides on and off, and has been decorated with a layered flower. 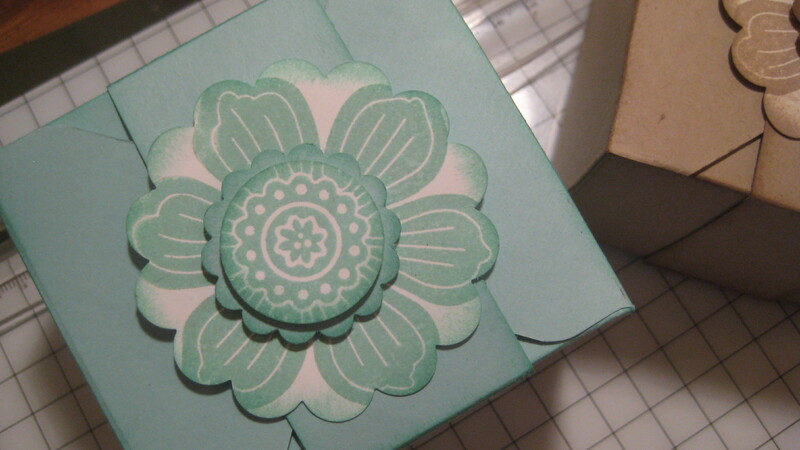 For the box, you need a piece of card 8″ x 8″ (20.3 x 20.3cm) which you score at 2 1/2″ (6.3cm) and 5 3/8″(13.2cm). 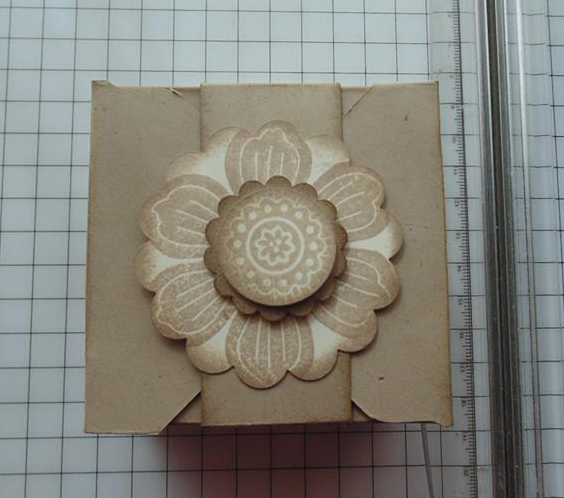 Because the punch board does not extend to 5 3/8″, the easiest thing to do is use either the Stampin’ Up! Trimmer or Simply Scored. The belly band is a piece of card 1 1/4″ (3.3cm) wide, 11 3/4″ (29.8cm) long (or the full length of an A4 sheet) and scored at 3″, 5″, 8″, 10.” (7.62, 12.7, 20.3 and 25.4cm) Then it is simply wrapped around the box and the decoration is then added to the top. If you have any question, or would like to get your hands on any of the goodies I have used to make these pretty boxes, please feel free to contact me.